Birthplace : Birmingham, Alabama, U.S.
Eric Bledsoe is an American basketball player for the Los Angeles Clippers. A Birmingham, Alabama native...averaged 10.0 points, 4.2 rebounds and 3.6 assists for the Clippers’ entry in the 2010 NBA Summer League…led Parker High School in Birmingham, Alabama with 20.3 points, 9.4 rebounds and 11.5 assists per game as a senior helping them to a second place finish in the 5A Alabama State Championship in 2009...played in the 2009 Wazoo Sports Derby Festival Basketball Classic presented by Papajohns.com...coming out of high school was named No. 1 Super Senior by Birmingham News and ranked the third-best point guard in the country and 23rd overall by Rivals.com. 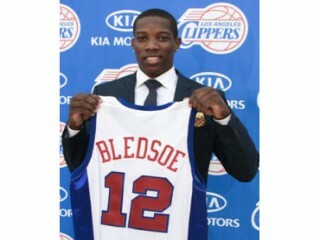 View the full website biography of Eric Bledsoe.